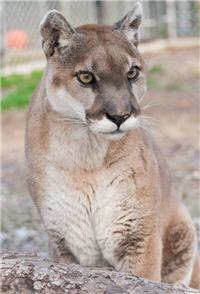 Crimson came to live with us in May 2007 along with a family of four other cougars and a tiger. Her owners had been in contact with us for 3 years hoping we would have room for their cats since they had a desire to move out of state. 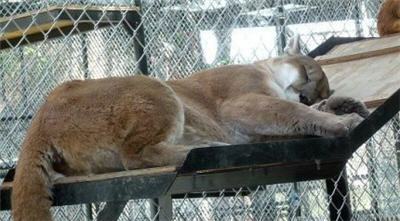 We took in the cats, hoping we could place some of the them in other facilities. 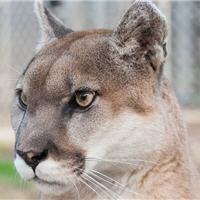 Unfortunately, the only facility that could help us wanted only one male and one female cougar, and we didn’t have the heart to break up Crimson and her friends who have been together for many years. Crimson has an exotic look to her with her beautiful, slanted eyes. It took a few days for her to adjust to her new home. She quietly hid in her den coming out only for dinner. She’s now very comfortable although still quiet and reserved. 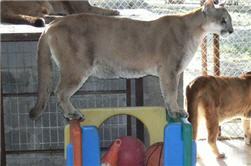 She loves to play with toys, rest high up on the platform and snuggle with Keenan inside the den.